In the last posting I mentioned a little about the construction or composition of this painting. Its a subject I’m the most uncomfortable with because its that which starts as a vague idea and grows into a form continually changing. The inspiration driving us to attempt a particular painting, decides the shape and direction the painting will follow. So its difficult to quantify and put into words. In traditional landscape painting there are simple guidelines like placing objects off centre and balancing the the whole arrangement. In reality I find it much more complicated than this but I like having a framework or guide to follow. Its difficult to create in a vacuum. All painting is ultimately abstract. The apparent balance, colour harmony and recognisable scene, etc., collectively are like the cover of a book – an invitation to read the contents. Unlike a book the contents are not literal, more like a piece of music, you like it or you don’t and you can’t say why. I learn a lot from watching other artists work. As the saying goes, ‘a picture is worth a thousand words’ and a moving picture is worth even more. Here is the video of this painting. See you soon. 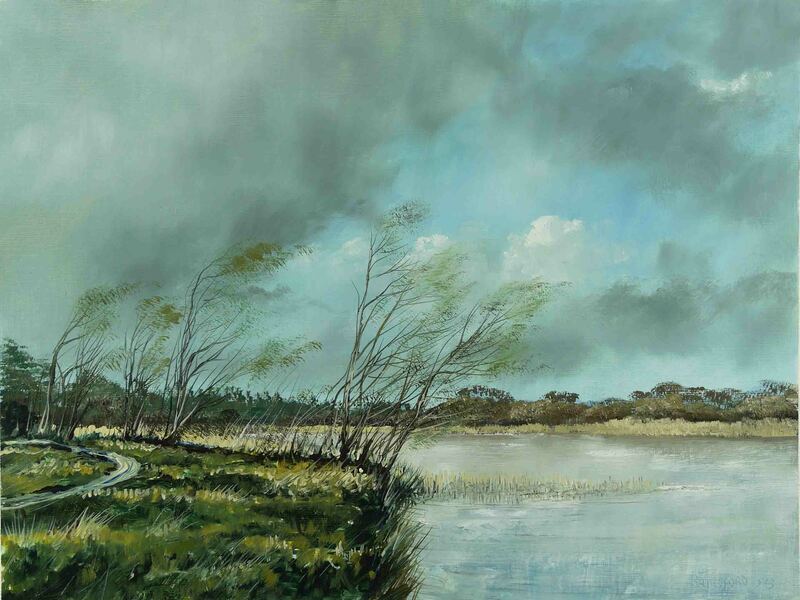 This entry was posted in Oil Painting and tagged Alkyd, Art, Culture, Education, green, Inspiration, Irish landscape, lake, May, Oil Painting, Oil Painting Instruction, Oil Painting Landscape, painting, Pictures, Sky, Spring, Time lapse painting, Trees, Water, Wind. Bookmark the permalink. You are very welcome Susan and thank you.